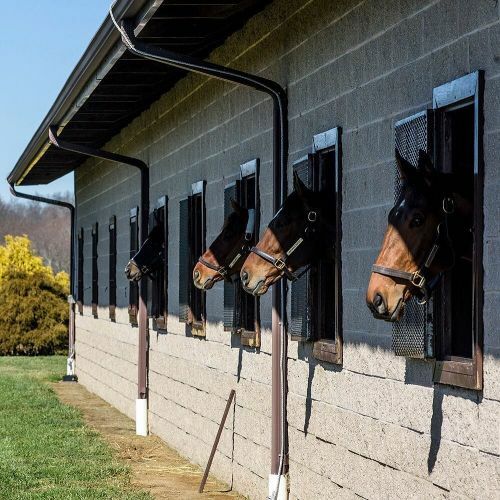 "Stalls with a view: open windows in the back the stalls at Tapeta Farm give #racehorses better ventilation and a view of the 250-acre facility. On Tuesday, the horse trainer Michael Dickinson — who's returning to training thoroughbreds after an 8-year absence — showed off a multimillion makeover of his farm, which is near the Chesapeake Bay in Maryland. Michael, who's known by the nickname Mad Genius, has a lot of ideas. Some, like the windows, are simple. Others, like saltwater whirlpools and steaming the hay, probably seem indulgent. But in his previous years as a trainer, he earned a reputation as a true friend of the horse. He spoke out against drug use, and his horses were in always in immaculate condition. "If you treat the horses well, they will treat you well," he told @nytimessports. "I have no expectations except to be a better trainer than I was." To see more of @mattrothphoto's pictures of Tapeta farm, visit the link in our profile. #🐴" By nytimes on Instagram.